A few weeks ago, I bought a LiveScribe Pulse Smartpen, and want to share my experiences with it so far. I bought the 2GB Pulse for $200 and there is a 1GB Pulse available for $50 less. The Pulse Smartpen works just like a normal pen, but it has electronics in side of it. When you write on special paper (more on that in a minute), it will capture everything you write or draw on that paper and store it digitally. You have the option of recording audio along with it, and the audio is automatically time-synchronized with what you wrote. LiveScribe has a strong focus on students, providing a means to capture notes and audio from lectures to enhance your ability to recall information from lectures. I find that it works equally well in a business environment, and it's particularly useful in the way that it frees you up to focus more on participating in group discussions instead of spending all your time trying to take really detailed notes. It is also great for capturing "chalk talk" diagrams so you can refer to them later or share that information with others. The Pulse has a built-in microphone that captures information from the room around you. I find that it does a very good job of picking up voices in the room, even in large conference rooms. If you need higher quality recordings, you can use the included headphones which have tiny microphones in them. These headphones allow you to store higher quality, stereo recordings of the session you're in and create "3D sessions" you can listen to later. As mentioned above, you need special paper to take advantage of the Pulse's power. Their paper (I use the Moleskine-esque LiveScribe journals) is specially encoded so the pen can tell which notebook you're using (it can track multiple notebooks simultaneously, and which page you're writing on. The pen has a small 'camera' of some kind built into it that allows it to see microscopic dots on the page and record page number and pen position. It also uses this information to synchronize the audio with what you wrote on the page. You can choose from a variety of paper types, including Journal style, spiral notebook style, lined, unlined, etc. and the prices seem reasonable compared to the "normal" alternatives of similar paper quality. What can I do with my notes and recordings? Store: After you've captured your notes, you synchronize them with the included LiveScribe Desktop software using a small, USB docking/charging station. The LiveScribe software imports your drawings and audio, then organizes it into a very user-friendly interface so you can browse, search, and share your notes with others. Search: The software automatically indexes the words you've written on the page, so you can search through large amounts of information and find what you're looking for very quickly. Print: You can print out your notes on any printer, with the option to print or omit the background lines (if you're using a lined notebook). The printouts look great, and I have used them to share whiteboard diagrams and concept sketches. Share: LiveScribe's sharing capabilities are very interesting. 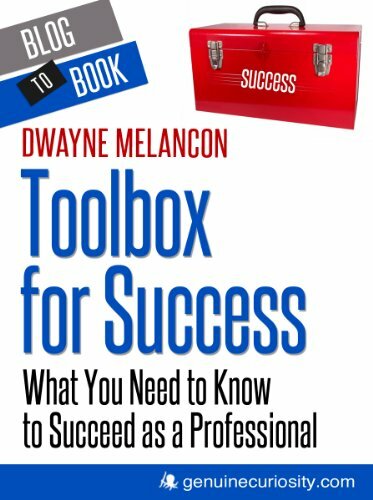 Not only can you share hard copies, paste notes into email, Evernote, OneNote, etc. but you can use LiveScribe Online (an account on the sharing site is included with your purchase) to share your sessions with others. You can control access to these sessions by inviting specific people to view your sessions, or make them public. 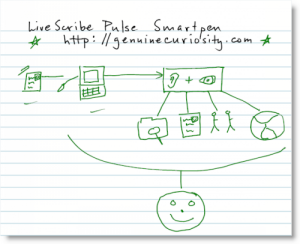 I have posted a brief, public walkthrough of the LiveScribe Pulse Smartpen so you can see what kind of results it creates (you can also click on the image of my diagram, at right). You can go into full screen mode by clicking the "expand" arrow from the player. When you view this session, experiment with moving around the session by clicking around on the diagram. Incidentally - the audio you hear was recorded by the internal Pulse microphone as I drew the images you see. The battery life and storage capacity are excellent. I have gone over a week without docking the Pulse and still had plenty of battery left. I haven't had to significantly change my habits to get the benefits of the Pulse Smartpen. I just write like I normally do, and the pen does the rest. The only new habits are a) remembering to turn the pen on so my writing is captured, and b) remembering to start and stop the recording when I'm doing audio capture. The pen is a tad thick, but it is comfortable to write with. I don't want to forget the pen, so I bought a folio cover and epoxied the pen sleeve to the inside cover to make them a single, portable unit (see picture here). This has been very useful. The bottom line: I like the LiveScribe Pulse Smartpen and recommend it highly.